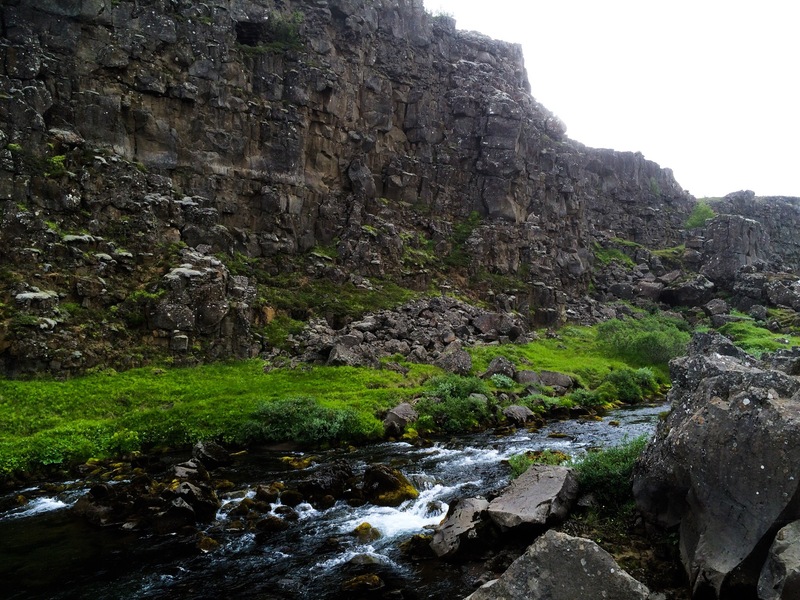 Iceland seemed the natural choice for my first of many solo adventures. 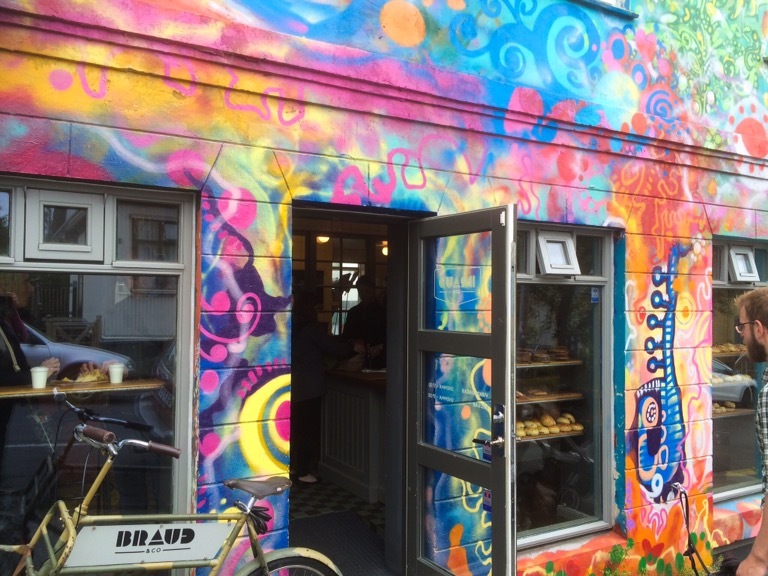 It was somewhere I’d always wanted to go, Reykjavik (so I’d heard) was a beautiful small and safe city and everyone who has been seemed to adore it. It was an incredibly spontaneous trip, booking 6 days before departure, and giving me only a few days to ask for advice, book tours and make some sort of itinerary of all the things I wanted to see in my trip. I am quite a control freak; I get quite anxious if I’m not sure what is happening, but I wanted this trip to be relaxing and help alleviate these feelings. As such, I booked a few things in advance to make sure I got the most out of my time. I wrote down the places I’d been recommended but also, and most importantly, left some space to discover places and to just ‘be’. This worked incredibly well for me, as I had the satisfaction of ticking everything I wanted to do off my list, but also not getting stressed about not running to time, or not allowing myself to take detours or make spur of the moment decisions. 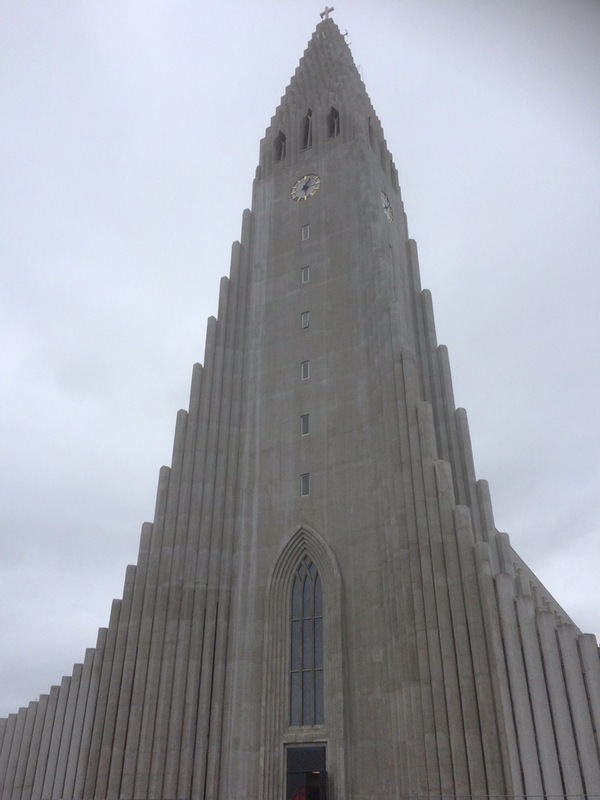 I arrived in Reykjavik on a cloudy Sunday afternoon, with my small backpack, a map and a vague idea of where I was going. After my airport transfer, I was planning on walking from the bus station to my hostel. 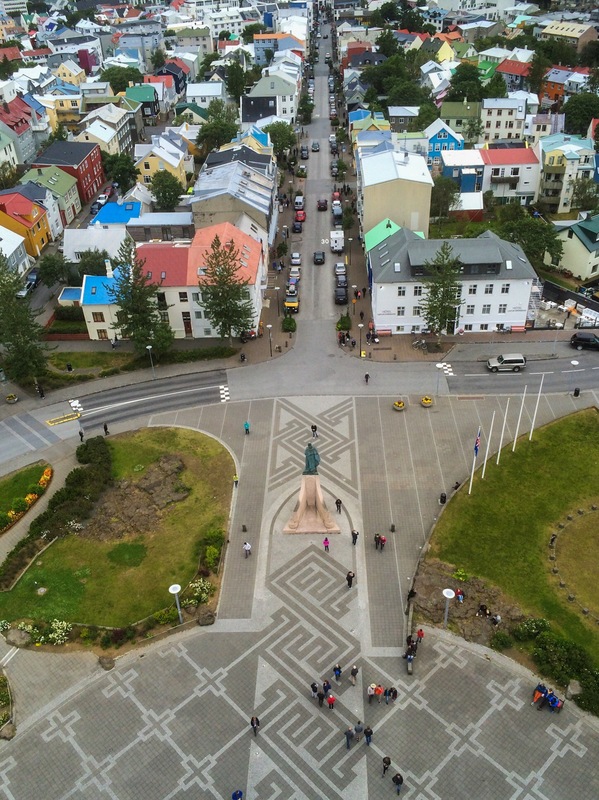 However I did not appreciate how small Reykjavik is, and upon my tumbled across Hallgrímskirkja. This was on my list to see, and decided to nip in as I was passing. 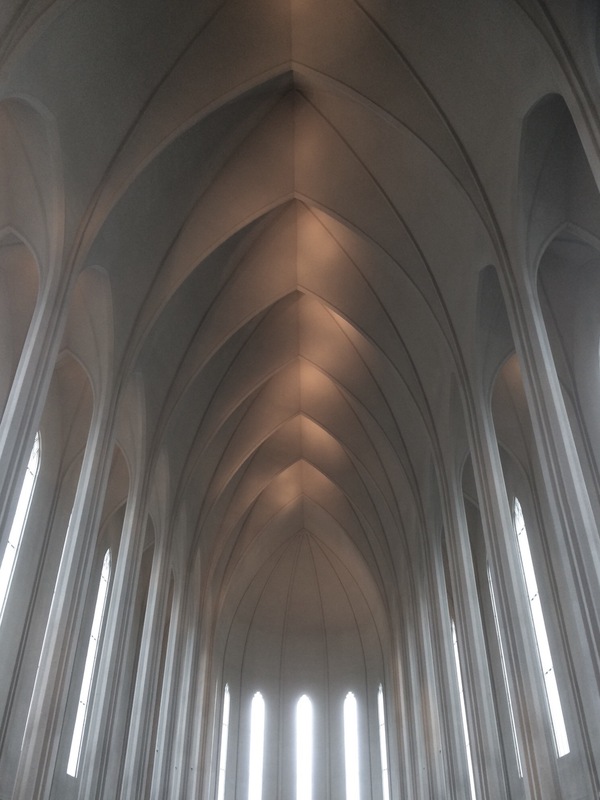 Hallgrímskirkja is a stunning Lutheran church. I’m not one for churches necessarily- on an Interrail trip around Europe some years ago, most of the cities recommended visiting the churches, and by the time we arrived in Venice I was almost desensitised to the beautiful architecture I was witness to. However this church was different. It was white, airy, modern and serene. I took a welcome seat, and although not a religious person, used the quiet and ambience to reflect on a difficult few weeks. I then decided to take the lift up to the tower. 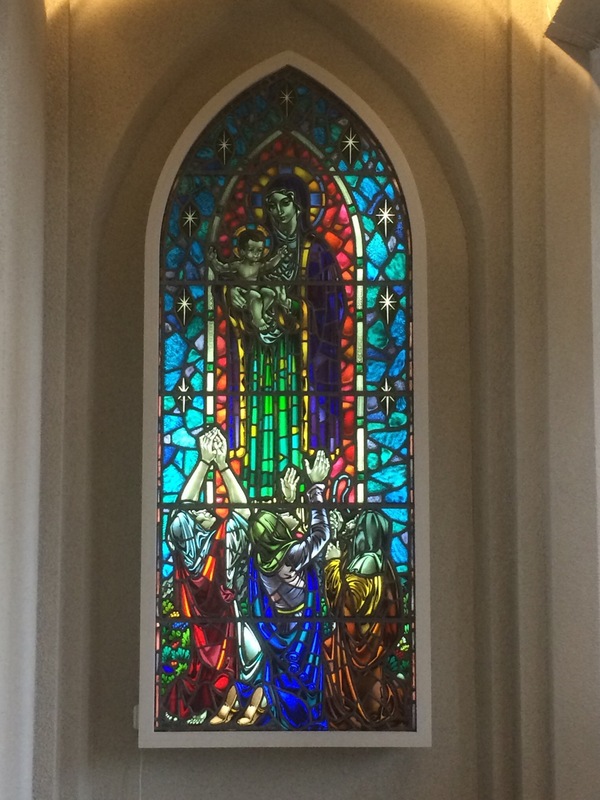 Priced at 900ISK (around £5.50) it was likely more than I’d ever paid to go up a church tower, but I’m glad I did. The views were lovely, and it gave me a real good feel for the scale and architecture of the city. The second great thing about this detour was having to take a different route than planned to the hostel, passing by a brightly decorated bakery. By this point I had hunger grumbles, and the cakes in the window were too good to pass by. Slightly nervous, as I realise I had no idea what the cakes were called, and by this point having gotten away with not having to sustaining a conversation longer than ‘Bus Station please’ I was unsure how stupid I would look aimlessly pointing at baked goods. However, after I said hello I realised I had very little to worry about as the lady behind the till replied in flawless English- which was the case for everyone I met over my trip. She explained they had vanilla buns that had just come out of the oven, which is quite simple the best thing I had ever tasted. I returned a few times over my visit, but my timing was never as perfect as this! After dumping my bag at my hostel, informing people back home I was alive and changing my shoes (Iceland was much warmer than expected, over my visit temperatures soared to 18 degrees Celsius!) 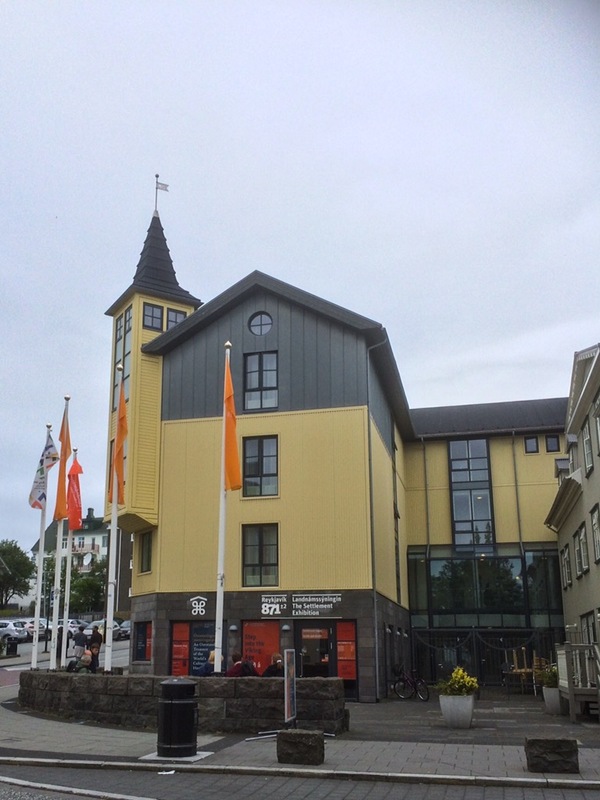 I walked along the shopping street Laugavegur towards the Settlement 871 +\-2 Exhibition. This was something I was incredibly looking forward to as I’d heard about the innovative presentation of the exhibition. I was not disappointed! I managed to catch a temporary exhibition of the Sagas, which were mentioned countless times during my trip and it was amazing to see these documents first hand. 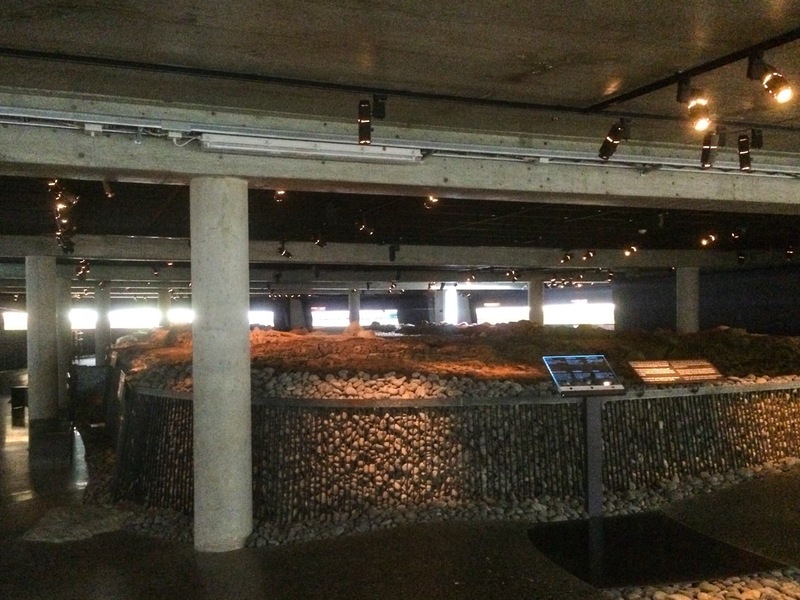 For 2,200ISK (£13.50) I was able to see the Sagas as well as the main exhibition, a tenth century longhouse excavated in 2001 and preserved at its original location, as well as examples of the oldest relics of human habitation in Reykjavik which gave a great insight into life in Viking times. The way this hall was presented and preserved was incredible, with digital displays enabling you to scroll through time to witness the building phases of the hall, touch screen interactive plans and reconstructions of the hall. North of this hall are remnants of a turf wall, some built before 871 +\-2. 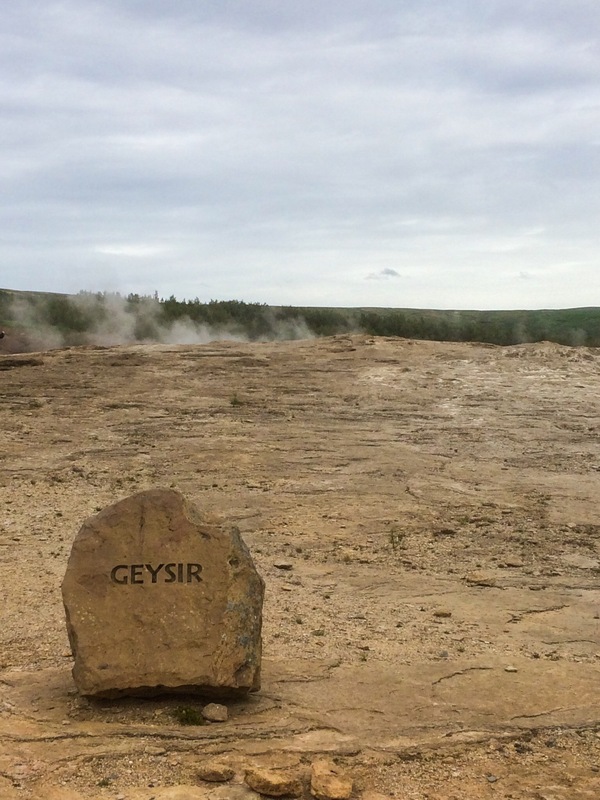 The reason for this date, and the name of the exhibition, is due to a major volcanic eruption which resulted in a layer of date able tephra being spread. 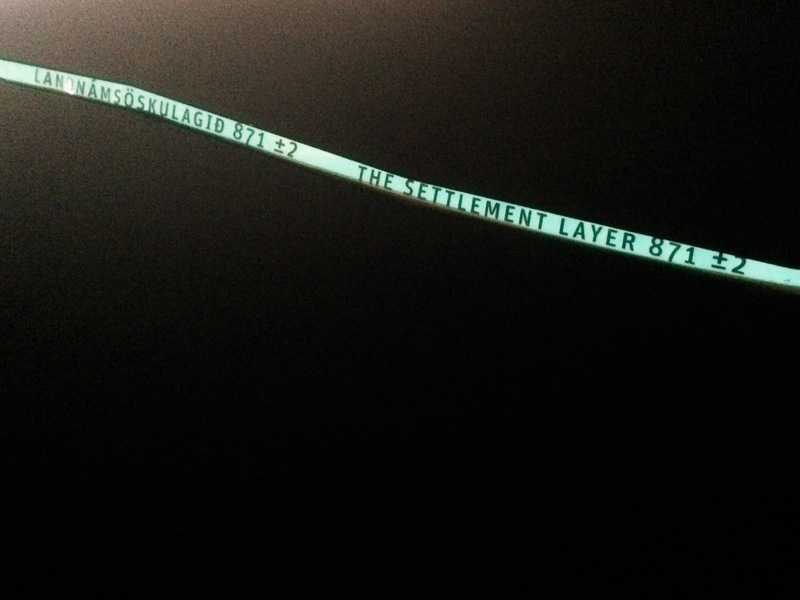 This layer is pointed out throughout the exhibition, and is first introduced on the stairs on the way down to the exhibition. 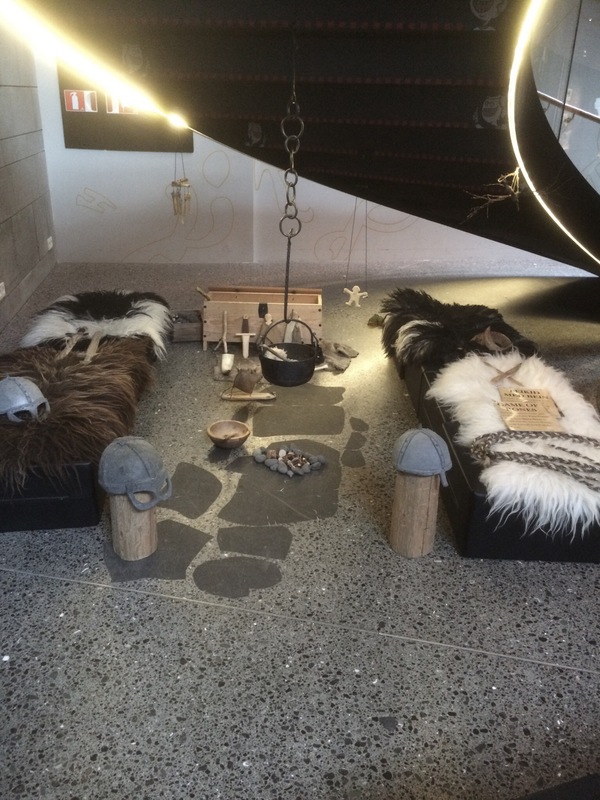 I would recommend this museum to anyone and everyone! I was a little gutted to not be a child, and be unable to play in this amazing area! 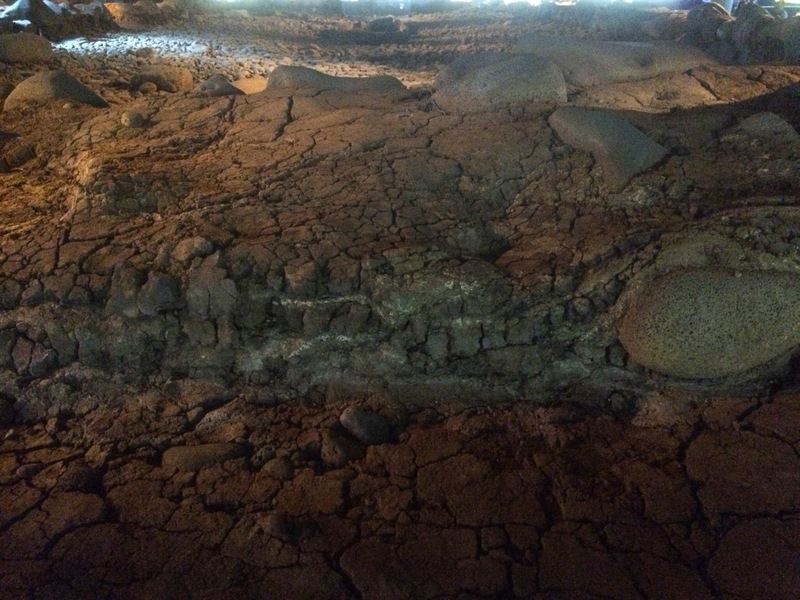 The dated volcanic layer, which is indicated throughout the museum, along the walls and first introduced on the stairs on the way to the exhibition! 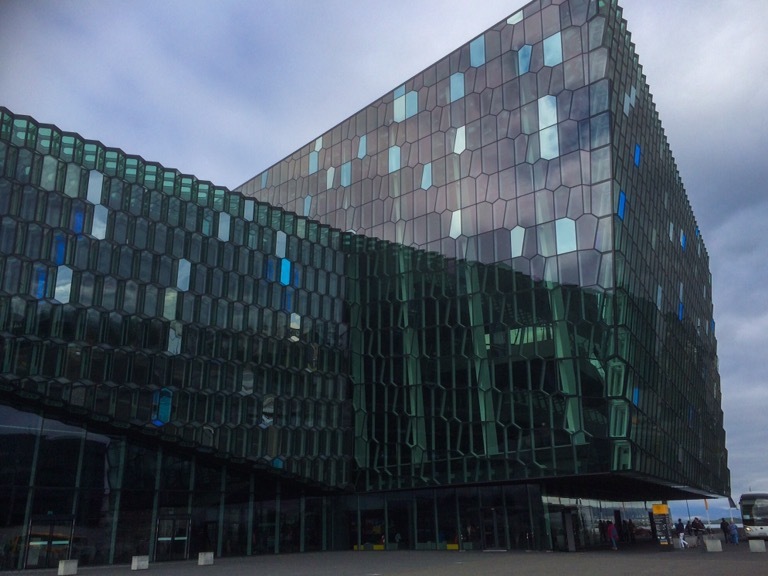 The rest of the day was a chilled walk along the seafront, towards Harpa- the concert hall. 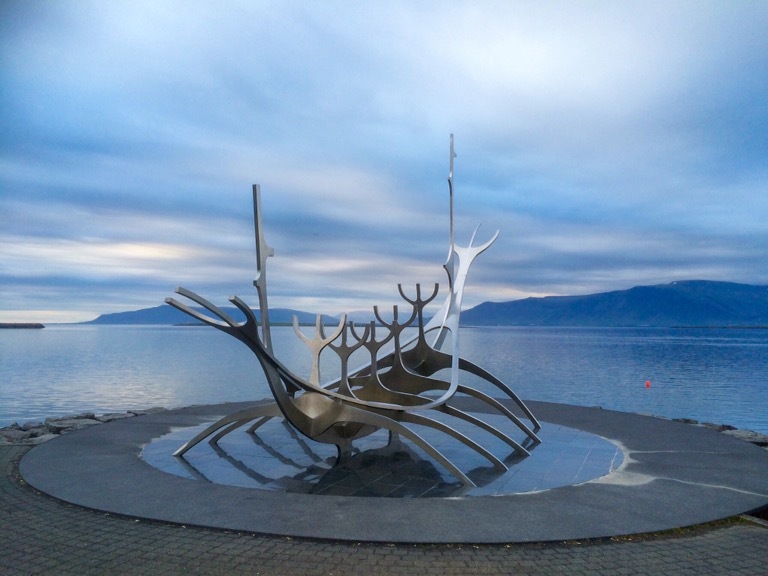 I saw Jön Gunnar Ámason’s Sun Voyager sculpture, which represents a mixture between fantasy vessels and boatbuilding knowledge and represents ‘promises of a primeval land’ before taking the time to sit on the rocks and look out to the sea. The beautiful Sun Voayger, which looks different in each light. 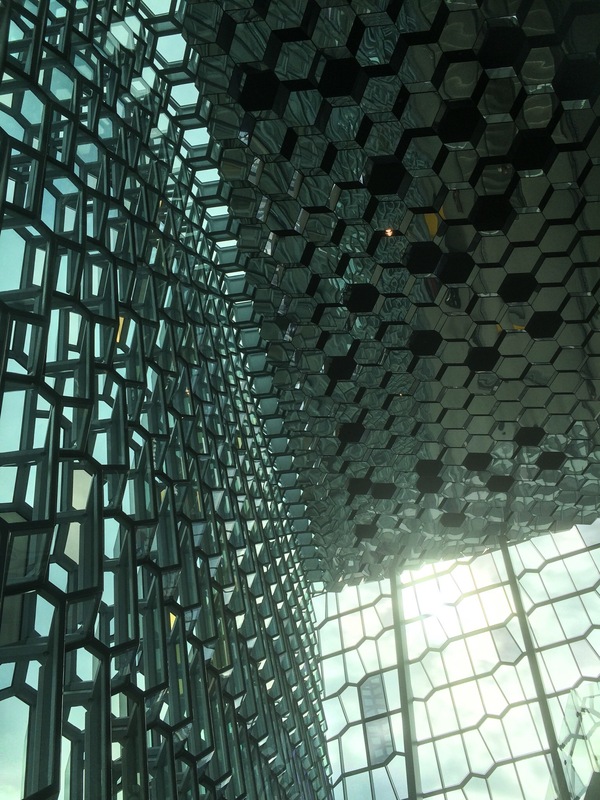 Harpa is quite stunning from the outside, made of numerous glass cells, some coloured representing the Aurora. However I felt the real beauty was from the inside. If you like order, shapes, and clean lines them you’d love the interior of this building. Whilst inside, I saw adverts for various shows, not in my ‘plan’, and my eye caught a banner for Icelandic Sagas Greatest Hits in 75 Minutes. I’d seen the Sagas and the exhibition had spoken about the significance of these texts but I didn’t really know much about the content. So spontaneous decision 2, I booked tickets for later that evening, giving me time for tea at a place I’d been recommended and I knew was nearby (and this decision may have even been better than the vanilla bun). I love fish and seafood, so the old harbour seemed a natural choice for tea. I went for the recommended Sægreifinn (Sea Baron) which has a fantastic visual menu of a huge variety of fresh, skewered fish. 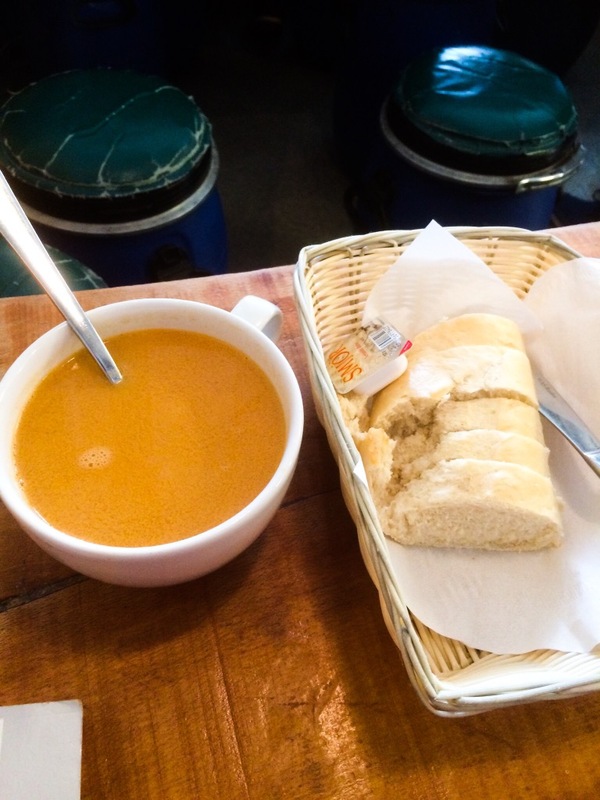 I opted for the ‘speciality’ which was their lobster soup which arrived with fresh warm bread and it was absolutely delicious. I also enjoyed checking out everyone’s order, like some weird food stalker, and wondering what I was going to an end on my next visit- however I never made it back. 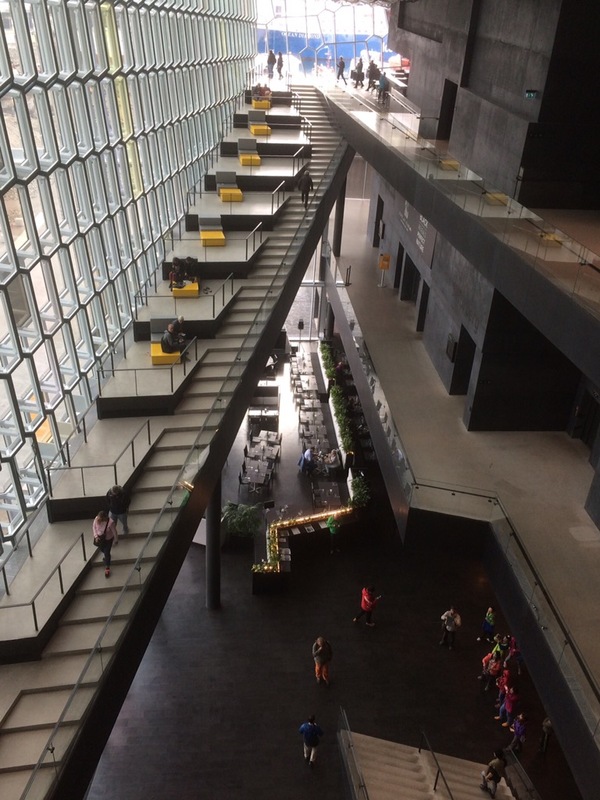 Finally, I returned to Harpa for the Saga show. I was a little nervous; I rarely opt for live shows as I get too anxiously something will go wrong for the performers! However, this was one of the funniest, most engaging shows I’ve ever seen. 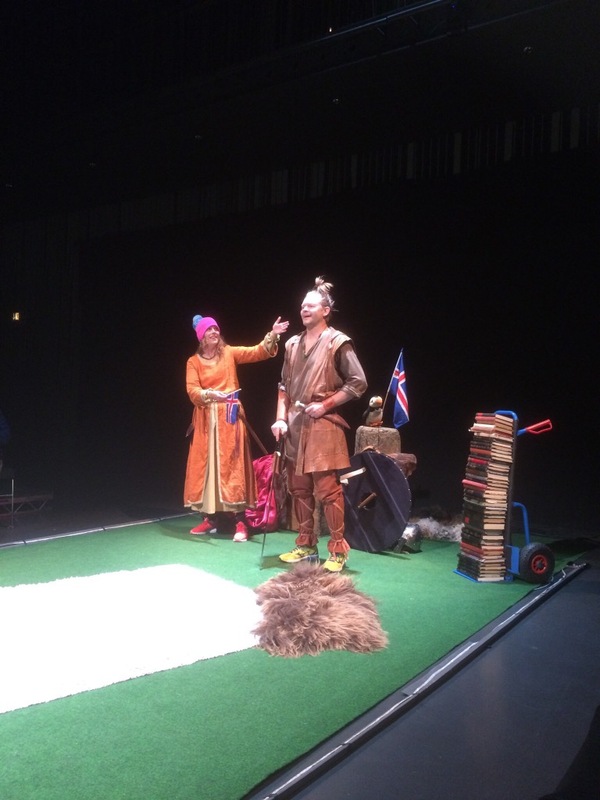 A funny modern take, on the stories which form the basic of the Icelandic national identity, with plenty of laughs and audience participation. 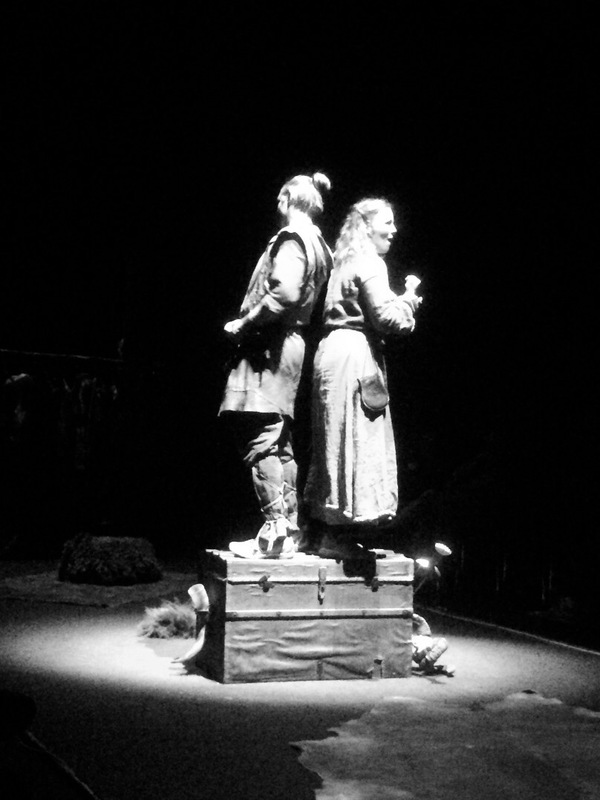 I realised how much I enjoyed seeing the show alone, as I became less anxious about whether my company was enjoying themselves, and could just relish in the fact I was laughing from my belly. This was a fantastic way to end day 1- and I returned back to the hostel not quite believing I’d only been here for an afternoon! 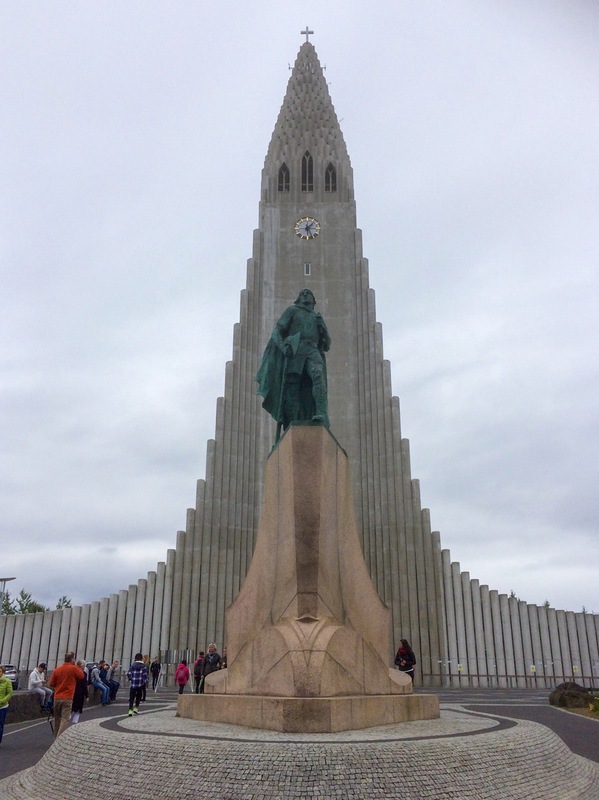 The next morning I opted for a guided city walk of Reykjavik (www.citwalk.is). I’m not huge on guidebooks, as I’m bad for reading information and really taking in it (I even opted for the audio guide in the Settlement Exhibition, despite the printed English interpretation), and the tour was a great way to learn new information about places I’d just wandered past. 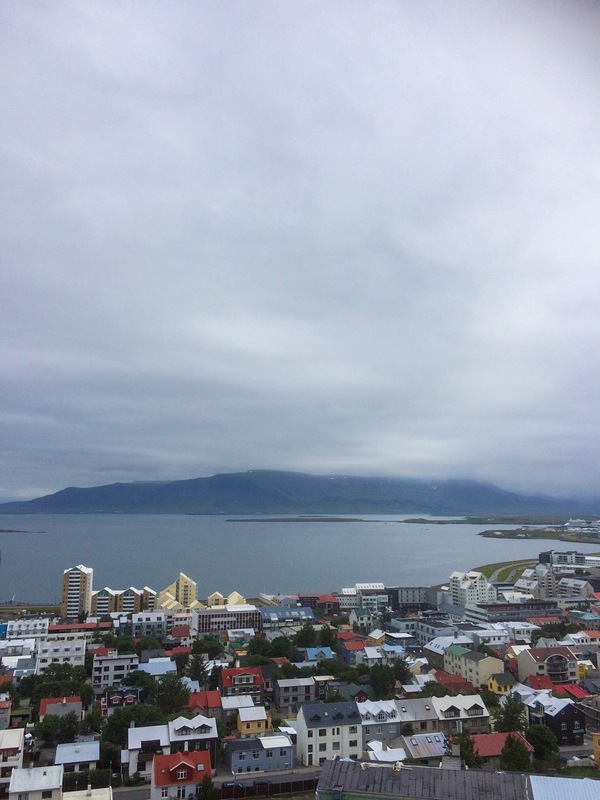 As the city isn’t huge, most of the places I’d seen or visited before, however it was interesting to hear even more about Iceland, including their naming system and their commitment and celebration of gender equality. Also, our tour guide pointed us to a cheap but absolutely amazing hot dog stand so that made me happy. All of the food I ate in Iceland was incredible, from the fresh buns to the lobster soup, the hot dogs to this amazing whippy ice cream which was dipped in chocolate, and I’m still not over it! My horse was named after an Icelandic God and I forgot the name, but I’d already decided my horse was called Pauly Paul and he was so lovely. When I somehow managed to get on Pauly Paul, he wandered off into the end of the paddock and the instructed explained he likes to do his own thing often, and sometimes gets moody because he has stomach problems- so I’d found my spirit animal and off we went. 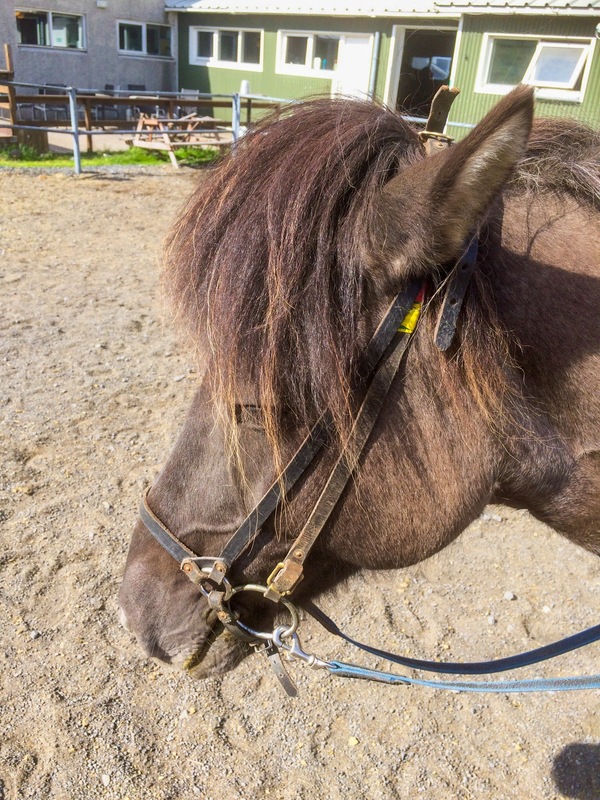 Icelandic horses are beautiful, not quite a fully sized horse as we’d see in Britain, but larger than a pony with a stockier, broader stature. If I had to choose one thing to do again whilst here, it would be this. 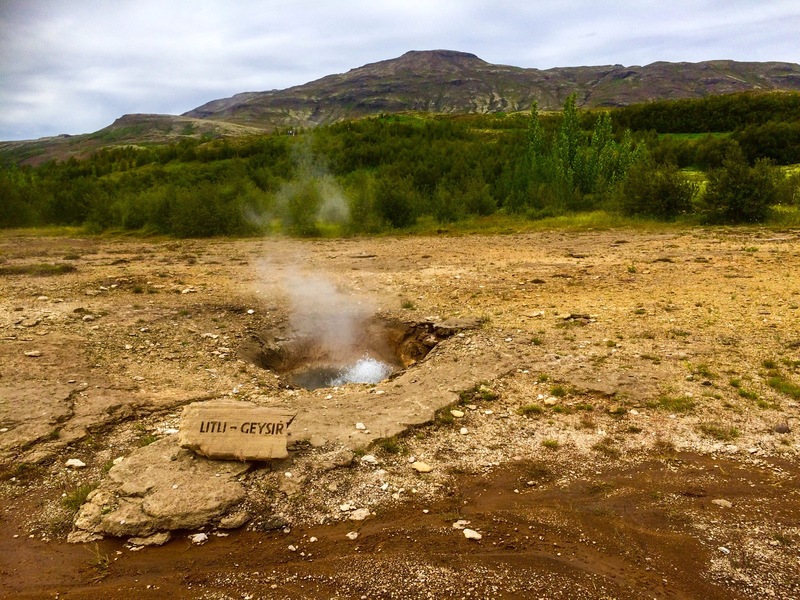 On my last day it was time to embark on a typical tourist tour of the Golden Circle. 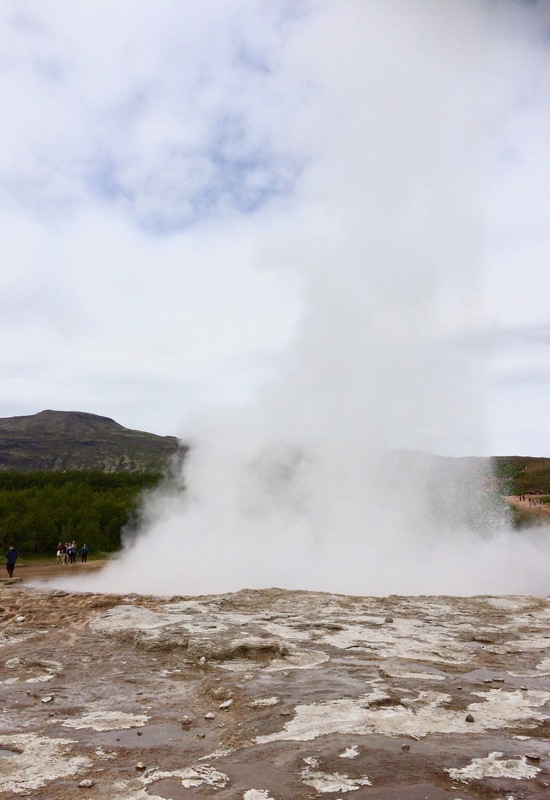 I was skeptical about this, as I was nervous that the amount of tourists may detract from the beauty of the natural places we were to visit (a little hypocritical coming from a tourist…) however the day was lovely, relaxed and not at all rushed. 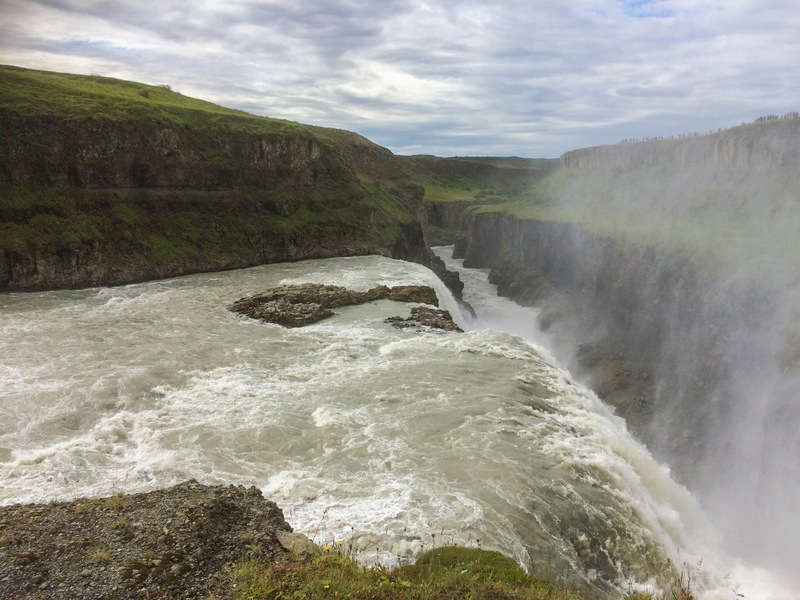 We visited Gullfoss Waterfall, Geyser, Pingvellir National Park (The Parliament Fields) and Kerið Crater. I saw two merlons flying overhead at the crater, which I’d never seen before! 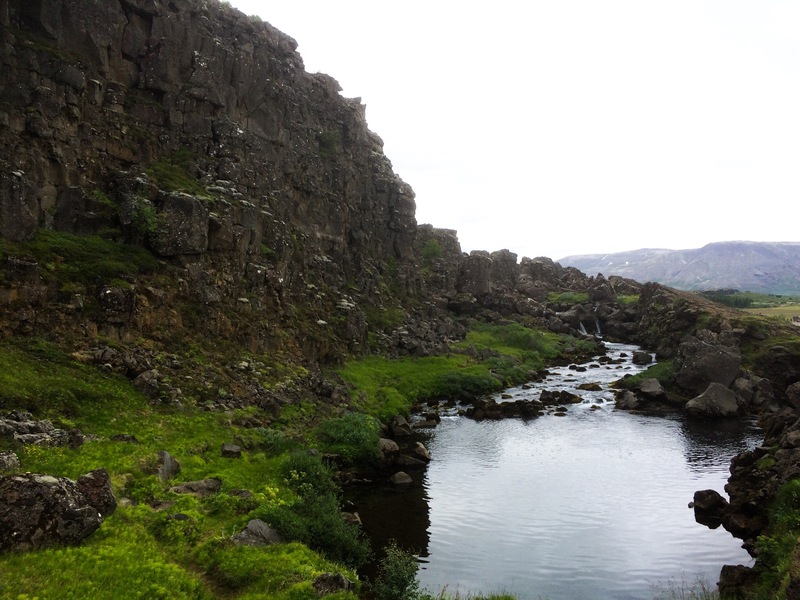 My favourite of all the places was the Pingvellir National Park, and I am not really sure why. Perhaps it encapsulated all of the different natural wonders I’d seen- beautiful rock formations formed by tectonic activity, running water, waterfalls, large open plains and mountains in the background- whilst also of huge cultural significance, serving as the meeting place for Parliament. I will return to this serene country one day. However, my list of adventures is growing by the day. I’m planning on hiking the British 3 peaks this autumn and driving the Scottish North Coast 500 route for my 26th Birthday. Abroad I’m eyeing Scandinavian cities, and Nepal- a bit further afield. I’m always happy to listen to suggestions for places to visit and activities whilst there! 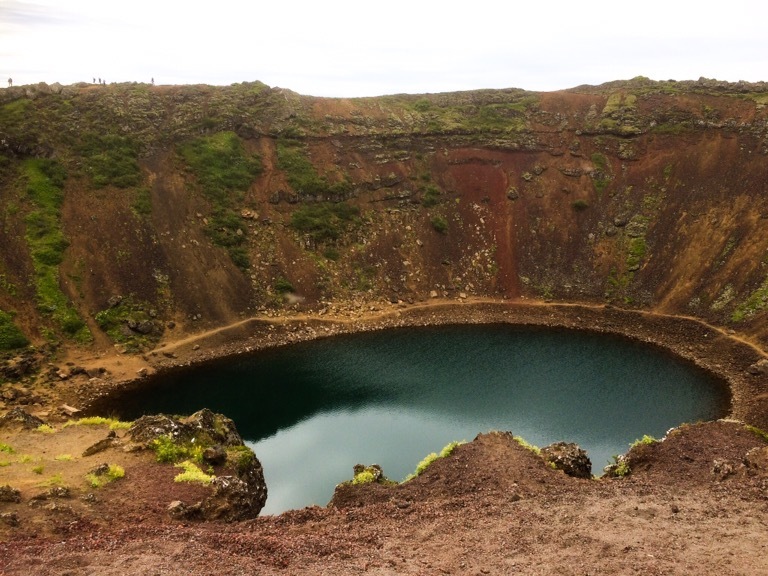 You have made Iceland sound absolutely amazing – really want to visit now! I went to Stockholm many years ago and adored it so would def recommend for one of your future Scandinavian trips. Also yay to the joys of travelling solo!!! Glad I’ve inspired someone to visit! Stockholm is on my list! Travelling solo is the best thing I’ve ever done- I’m the only person in the trip I have to please!